The mission of the ESA Planck satellite is to observe the Universe of the past, seeing back in time, right after the Big Bang. 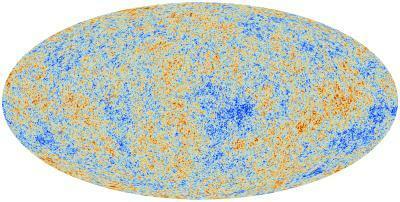 The image that the Planck scientists revealed today is that of the Universe as a child, dating back to about 380,000 years after the Big Bang, when its temperature was similar to that of the most external layer of a star today. The Planck satellite was launched in May 2009 and has been observing the Universe's fossil radiation. In Trieste scientists have analyzed data delivered by the LFI (Low Frequency Instrument), the instrument that detects the radiation within the 30 to 70 GHz interval. The Trieste team, which comprises SISSA and INAF-Osservatorio Astronomico, with the collaboration of Università di Trieste, has contributed to the drafting of thirty papers published today in Astronomy&Astrophysics. "The maps we have obtained feature levels of resolution and sensitivity never achieved before, a milestone in modern cosmology," explains Andrea Zacchei, a researcher at the Osservatorio Astronomico of Trieste who, following Fabio Pasian, is now in charge of the entire data analysis of the LFI. "In a year's time the challenge will be even greater, as we will try to conclude the analysis of polarization data which may give us a few surprises regarding our comprehension of the Universe." The polarization is in fact the "direction" taken by the light, perpendicular to that in which it travels, that "remembers" very well the one that had been impressed on the Big Bang and it may therefore convey very important information. "The observations carried out by Planck reveal with unprecedented exactness the imprint of the Big Bang on the fossil radiation. This the first time that man can look with such clearness at the origin of our Universe, in which we see the impact of forms of matter and energy still unknown today," adds Carlo Baccigalupi, a cosmologist at SISSA. "In order to comprehend Planck's data we still have to focus on the most mysterious part of the signal, in which we may look for space-time oscillations of cosmological dimension, and such information that may help identify the physical processes that occurred at the time of the Big Bang. A lot of work for scientists for many years to come." The task of Baccigalupi, alongside Luigi Danese, Francesca Perrotta and the SISSA group, is to extract the signal of the Big Bang and the main astrophysical emissions. Ethan Siegel is updating context about the latest results on TrapIt.